Sepultura&apos;s "Machine Messiah Tour 2018"
Brazilian metal legends SEPULTURA just finished their »Machine Messiah EU Tour 2018« with support from German technical death metal masters OBSCURA, US-based death/black metallers GOATWHORE and New Jersey&apos;s finest deathcore outfit, FIT FOR AN AUTOPSY. Today, the band already announces some more tour news! 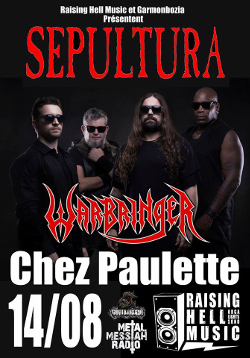 This summer, SEPULTURA will hit the road again to enter countless festival stages and also play some selected headline club shows throughout Europe. Presales start on Thursday, April 19th 2018, at 11:00am CET.